Greetings, everyone, and welcome to the first part of a series of tutorials where we learn how to create new campaigns in Telepath Tactics, step by individual step! As we go, feel free to refer to the Telepath Tactics manual, which provides thorough documentation on every last thing you can use while modding the game. * if you’re getting the Linux version, make sure to nab and install AIR first! I’m planning to create a Linux installer that doesn’t require this, but I’m not there just yet. Got it? All ready? Let’s begin! 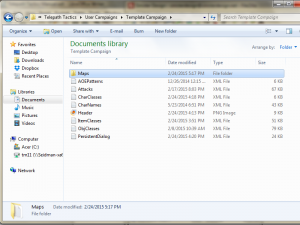 The directory for user-created campaigns is Documents > My Games > Telepath Tactics > User Campaigns. 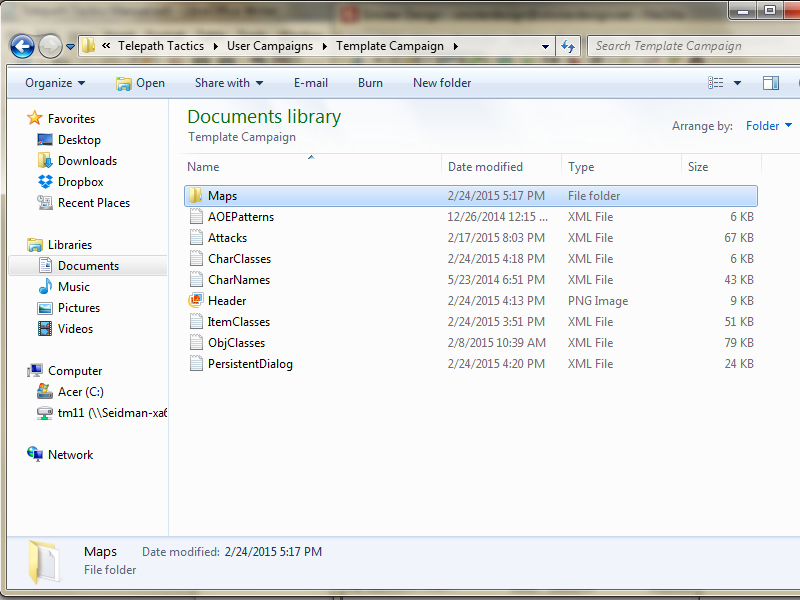 Whenever we create a new folder in this directory, Telepath Tactics will auto-detect it and add the folder’s name to the New Campaign list in-game. Rather than create all of these from scratch, let’s work off of a template campaign. Click this link to download the zipped template campaign, then unzip the file.You should now see a folder named Template Campaign. Just drag and drop that folder into Documents > My Games > Telepath Tactics > User Campaigns, then rename it to whatever you want to call your campaign. Within each campaign’s folder, you should see those 7 XML files I listed above, plus Header.png and a subfolder named Maps. Open Maps; inside, you should see an XML file named Introduction. Every single Telepath Tactics campaign starts with the Introduction scene! This is the scene where you begin your campaign’s story, either via narration or a dialog cut scene. We’ll start with narration here, since it’s easier to learn how to do. Inside Introduction.xml, you should see three tags: <Level>, <NewRoster>, and <Narration>. Ignore the first two; we’re just going to work with <Narration> for now. Between the opening tag (<Narration>) and the closing tag (</Narration>), you’ll see some text which reads Write your scrolling text introduction here. Delete that text and do what it said: write your campaign’s introduction right where the text was, in between the opening and closing Narration tags. Once, on the peaceful isle of Bunnysmile, there lived an evil skiakineticist named Captain Haterade. Captain Haterade hated all of the peaceful, happy people of Bunnysmile, and he set out to ruin their happiness with lots of unnecessary griping.-N-…oh, and bandits. He also had lots of bandits. Okay! We’re done with Introduction.xml for now, but we’ll be back later to add a couple of things. Save the file and exit. This entry was posted on Wednesday, February 25th, 2015 at 8:13 AM and is filed under Fan Stuff. This post is tagged modding, Telepath Tactics, tutorials. You can follow any responses to this entry through the RSS 2.0 feed. leave a response or trackback from your own site.